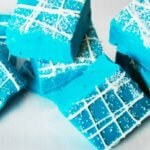 This cotton candy fudge is easy to make and such a fun flavor! Remove from fire and mix in the cotton candy flavor oil and food coloring and mix. Once the fudge has cooled, melt about 1 cup of the candy melts in a squirt bottle. I did this in the microwave running it on defrost 1 minute at a time and then shaking it up until it was evenly liquid. Quickly spread the sanding sugar all over the candy melts while it’s still warm.